This error is most likely generated by a secure wi-fi network using and encryption scheme like WEP or WPA. If you are sure that you should have access to this wi-fi network, it is most likely a typo. Remember capitalization counts! Chances are something changed on the wi-fi network and the Pre is using cached settings. The wi-fi network should be dynamically assigning an IP number for your session which would be different from the previous session. We need to clear out the old settings and the Pre can be stubborn. Tap the network name to open the Preferences. Go back to the WI-FI screen and search for a new network. Let the Pre find the network again and try to join it. You will need to enter your username and password, so keep them handy. If this attempt fails, tap on the network name again. Slide the Automatic IP settings to OFF and then to ON. If it works, you will see the IP address and the rest of the info on this screen filled in. Click the Done button and you will finally see that big check next to the network’s name. I have the same problem, it ocurrs when my bateri is empty, but i cant fix the problem doing your recommendation. Have you updated the WebOS to 1.4.1? I am not sure if it is available in Mexico. 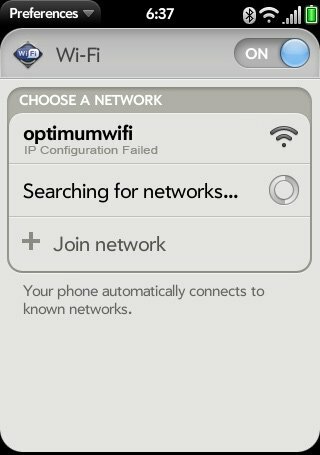 You can also try rebooting the phone, but I find public WIFI hotspots very unreliable with the Pre. It is much more reliable to use the phone carrier’s data plan when I am away from a secure network.